Tennessee Hot Tub Suites & Whirlpool Hotel Rooms in Nashville, Memphis, Gatlinburg & more. 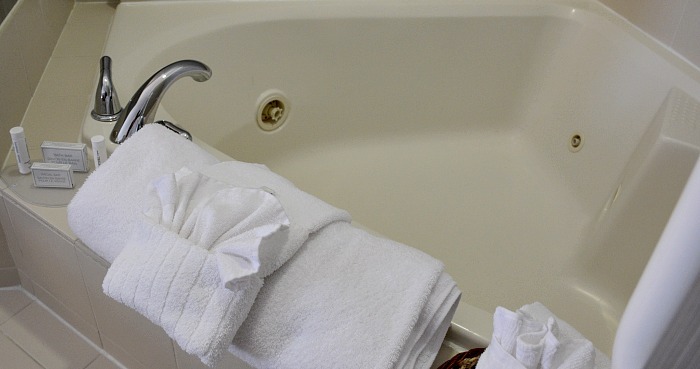 A Whirlpool Suite Can Turn Any Getaway in Tennessee into Something Special! Ask any couple on a romantic Tennessee getaway about the no.1 hotel amenity they prefer, and the majority will tell you right away that a hotel with a Whirlpool tub in the room is what they want the most. And that's where we come in, with our latest guide to Tennessee hot tub suites and jetted spa tubs in hotels, inns and resorts across this scenic Southern state. Here's to your best bubbly weekend in TN! Madison Hotel Memphis Whirlpool Suites - one bedroom King Suites include a comfortable spa tub at this award-winning four-diamond hotel in downtown Memphis. 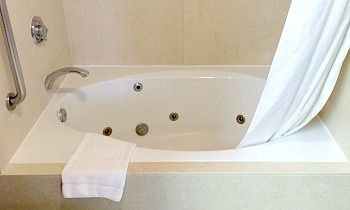 2017 Rating* for Hotel Suites with Whirlpool Tubs in Memphis: 84% of Couples Rate It Excellent/Very Good (79 Madison Ave, Memphis TN 901-333-1200). Courtyard Memphis East/Bill Morris Pkwy - great way to enjoy a hot tub hotel room getaway in Memphis at an inexpensive price. This Marriott also has an outdoor pool and their Bistro Restaurant on-site with beer, wine and Starbucks coffee. 2017 Rating* for Whirlpool Suites in Memphis, Tennessee: 70% of Couples Rate It Excellent/Very Good (3076 Kirby Pkwy, Memphis TN 901-365-6400). Hampton Inn & Suites Millington - only 18 miles north of Memphis, this Hampton Inn gets high marks for their friendly staff, new 50-inch flat screen TV's, and comfortable, bubbly in-room Whirlpool tubs. 2017 Rating* for Hot Tub Suite Hotels near Memphis: 96% of Couples Rate It Excellent/Very Good (8838 U.S Hwy 51 N, Millington TN 901-872-4435). Hilton Garden Inn Nashville Franklin/Cool Spring - romantic accents at this Hilton-chain hotel include their licensed Pavilion Lounge, a garden patio fire pit, and their King Suites with Whirlpool. 2017 Rating* for Nashville, TN Whirlpool Suites: 86% of Couples Rate It Excellent/Very Good (9150 Carothers Pkwy, Franklin TN 615-656-2700). Holiday Inn Express & Suites Nashville Opryland - this Holiday Inn gets top marks for friendly staff, clean comfortable rooms, and their romantic and inexpensive King Hot Tub Suites. 2017 Rating* for Whirlpool Suites Near Opryland: 78% of Couples Rate It Excellent/Very Good (2461 McGavock Pike, Nashville TN 615-829-7777). Hampton Inn & Suites Nashville Downtown - book into this reliable Hampton, and you’ll enjoy a spacious 2-room suite with private balcony and Whirlpool tub. 2017 Rating* for Nashville Hotel Spa Tub Suites: 82% of Couples Rate It Excellent/Very Good (310 4th Ave South, Nashville TN 615-277-5000). Carriage Lane Inn - romantic Inn & cottage close to downtown Murfreesboro, with a number of their tastefully-decorated theme rooms here (including the V.I.P. 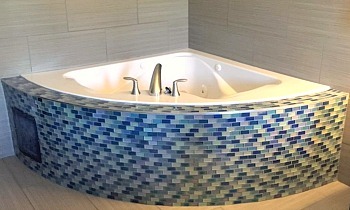 Suite) equipped with jetted tubs for your comfort and relaxation. 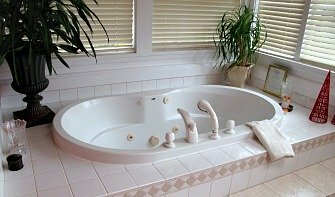 2017 Rating* for Central Tennessee Jetted Tub Suites: 82% of Couples Rate It Excellent/Very Good (337 E. Burton St, Murfreesboro TN 615-890-3630). 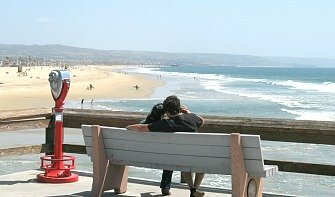 Romantic Tennessee Vacations - special selection of hotels, inns, B&B's for the perfect Tennessee getaway, honeymoon or anniversary trip. Missouri Jetted Tub Hotel Getaways - our latest guide to finding hotels and cabins in Missouri with a romantic Whirlpool tub or jetted spa tub for two. Hilton Garden Inn Chattanooga/Hamilton Place - just a mile from Hamilton Place Mall, this Hilton Garden Inn has free self-parking, Wi-Fi, indoor pool, and gorgeous suites with King beds and Whirlpool tubs. 2017 Rating* for Chattanooga TN Whirlpool Suites: 88% of Couples Rate It Excellent/Very Good (2343 Shallowford Village Dr, Chattanooga TN 423-308-4400). Courtyard Chattanooga Downtown - King Rooms with Whirlpool tubs, outside lounge area with fire pit, and you can walk to dining, brewpubs and just about everything in downtown Chattanooga. 2017 Rating* for Chattanooga Hot Tub Suites: 76% of Couples Rate It Excellent/Very Good (200 Chestnut St, Chattanooga TN 423-755-0971). Holiday Inn Express Hotel & Suites Knoxville-Farragut - indoor pool, a hot breakfast each morning, plus attractive in-room hot tubs make this Holiday Inn a favourite for couples weekend getaways in Eastern Tennessee. 2017 Rating* for Knoxville TN Hotel Spa Tub Suites: 97% of Couples Rate It Excellent/Very Good (816 N. Campbell Station Rd, Knoxville TN 865-966-2500). Hampton Inn Pigeon Forge - this Hampton hotel offers up some of the most attractive corner Whirlpool Suites with fireplace in downtown Gatlinburg. 2017 Rating* for Pigeon Forge Hot Tub Suites: 91% of Couples Rate It Excellent/Very Good (2497 Teaster Lane, Pigeon Forge TN 865-365-1588). Springhill Suites Pigeon Forge - an all-suites Marriott chain hotel featuring King Studio Suites with Whirlpool tubs (great room design with living area and mini-kitchen just around the corner from the tub and the bed), and close to microbreweries, steak houses and Starbucks. 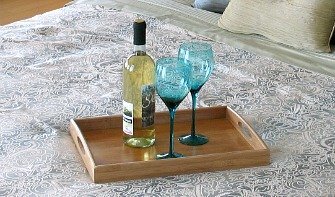 2017 Rating* for Pigeon Forge Hotels with Jetted Tub Suites: 89% of Couples Rate It Excellent/Very Good (120 Christmas Tree Ln, Pigeon Forge TN 865-453-4514). 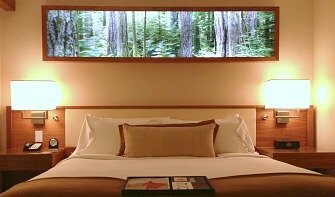 Hilton Garden Inn Gatlinburg TN Whirpool Suites - newlyweds and anniversary trippers will appreciate the 1-bedroom suites with King Beds and Whirlpool tubs at this attractive Hilton Inn which is very close to Great Smoky Mountains National Park (only 2 minutes walk). 2017 Rating* for Gatlinburg TN Whirlpool Suites: 89% of Couples Rate It Excellent/Very Good (635 River Rd, Gatlinburg TN 865-436-0048). Hampton Inn Sevierville - 3 things you’ll love about this Hot Tub Hotel in Eastern Tennessee are the King Suites with a Whirlpool Tub in the corner, the great night’s sleep you get in a Hampton Bed, and the complimentary hot breakfast in the morning. 2017 Rating* for Sevierville TN Whirlpool Suites: 86% of Couples Rate It Excellent/Very Good (681 Winfield Dunn Parkway, Sevierville TN 865-429-2005).